Since my name ends in a vowel, it may not be a surprise I like Italian food. 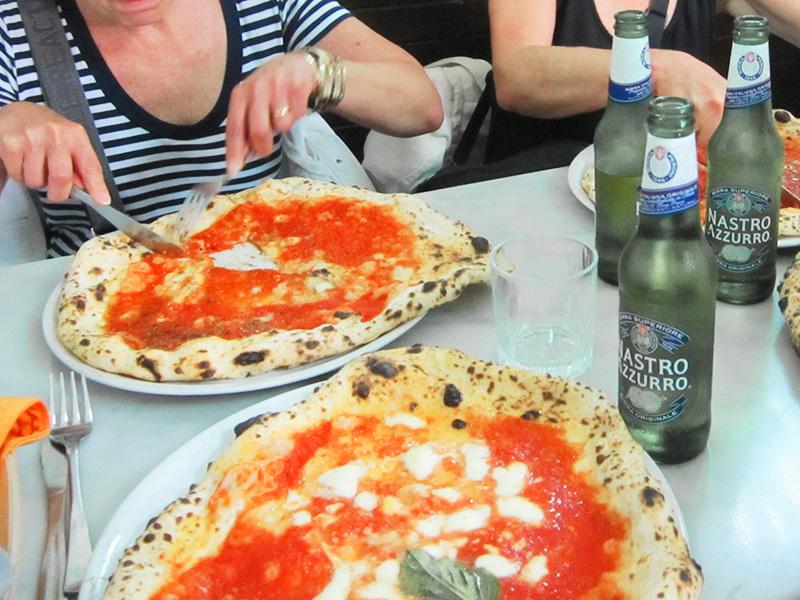 Which is why I wound up in Naples, Italy, the birthplace of pizza, searching for the perfect pie. I had done my homework and was on the trail of Don Michelle, which had been rated by numerous blogs, as well as Fodor’s and Elizabeth Gilbert, the author of Eat, Pray, Love (and Julia Roberts in the film of the same name), as making the best pizza in the world. If you’re looking for the perfect pie, I reasoned, research the reviews then follow their recommendations. Or so I thought. It was the desk clerk at our hotel in Naples who sent up the red flag when I asked him for directions. In typical Neapolitan-operatic fashion, he grimaced, rolled his eyes and threw up his hands. “I’ll tell you a much better place to go,” he said. “That’s a tourist place.” Nevertheless, I couldn’t dispute all the rave reviews, I told him. We ordered a taxi and set out for what I hoped would be my marinara nirvana. There were four of us – to be fair I had to bring along other tasters – and although we knew we would have to wait to enter the pizzeria, we didn’t expect the crowd to be as large as it was. I pushed my way through into the small restaurant, took a ticket from the rotund guy (who scribbled the number in our party on his end of the chit) and then went back to wait an hour or so in the hot Neapolitan sun for our number to be called. With us were fellow pizza pilgrims from all over the world, many taking pictures. A few had luggage with them, grabbing a bite either on their way to, or back from, the airport. Everyone remained intensely focused on the small doorway around which the crowd continually grew. Once inside we found the place non-descript and sterile – white-and-green-tile walls, wooden tables, pizza makers working an assembly line, waiters moving people in and out as quickly as possible. And, of course, a prominently placed photo of Julia Roberts hanging in front of the open kitchen. We each ordered a marinara pie and a beer, and when they came we all were surprised by the lack of quality and overall flavor. What about all those kudos from Fodor’s and Gilbert and the rest, I wondered. None of us thought this was anything special; In fact, the crusts were so chewy we literally had to tear them apart to eat them. It was all cash only, and though the prices on the wall showed each couple owed €21 (about $15 for a medium pie and beer for each of us), on the way out the waiter said to instead give him just €20 and a tip. We gave him the extra euro and he was happy. I recognized the name from my research. And since I was still on my search for the Holy Grail of Naples, that evening I dragged everyone off for yet another pie, or more precisely, four pies. It turned out the clerk was right — Sorbillo far outshone Don what’s-his-name. We got there about 7:30 pm and were seated within minutes. I soon noticed that there was no rush for anyone to eat quickly and get out, and many people were lingering to finish their drinks. In fact, many of the tables around us had only one or two people at them, although that could have been due to the relatively early hour for Italian dining. The pizzas were really good – exceptional crusts, tasty sauce and a good variety to choose from. While the other place only offered two varieties of pies — marinara and margherita — here we found a staggering 23 on the menu, each named after a child or grandchild, everyone a pizza-maker. And it was comfortable, not white-tile sterile, they took credit cards and no one asked for a tip, all pluses on my pizza-meter, but lost points for not serving Italian beer. Capisce, Sorbillo? German beer with pizza in Italy? When we left at 8:30 pm the crowd had grown quite a bit in size, mostly neighborhood people. So I’d recommend that if you go, be there around 7:30 — 8 o’clock, and you shouldn’t have much of a wait. But I had to return about 15-20 minutes later to retrieve something and found that the crowd had a least doubled in size. While there I went up the stairs along the sidewall to take a photo and discovered three additional dining rooms above, all full. Even more interesting, I discovered they would have delivered to our hotel. But taking that option meant we would have missed all that Neapolitan ambiance – the old narrow cobbled streets lined with shops, gelaterias and restaurants; the crowds, the noise of the night and even, in some odd way, the graffiti-covered walls that have become such an awful symbol of the city. Every neighborhood in Naples has its favorite pizzeria. So if you’re looking for a good pie you may want to first look online, then place your trust in your hotel clerk. OMG I am starving and want to go – maybe one day. This reminds me of Hyman’s, a “seafood” place in Charleston. It annually wins the Best Seafood in the South award from Southern Living Magazine. It caters to busloads of tourists. No local would ever go near the place but we are often asked by our visitors to take them there. We don’t. ola. io soi uno brasiliano de la famiglia ferri. io no parlo italiano. soi de marinna brasiliana e estarei en napole dia 6 7 8 i 9/11. io quero conecer una persona de mi famiglia. grace.